Cafe Blue Ginger, located in the main upscale shopping and dining district of Karachi, offers an eclectic menu in a rustic, cozy setting. The corner location on main Zamzama boulevard displays a beautiful view of the city's vintage façade, further adding to the cafe's theme. The dining room is adorned with heritage old windows and grills, while the dramatic entrance receives guests with a heavy antique door dating back to the early 20th century. The colonial ambiance represents the owner's fondness of art and creates a unique ambiance that can appreciated by all. In contrast to the previous surroundings of Café Blue Ginger at Galleria 919, the newly opened restaurant is centered amidst the hustle bustle of Karachi’s popular shopping and dining area, Zamzama. The earlier cuisine was strongly influenced by the restaurant's cooking expert Zubeda Tariq’s recipes while the new menu offers a tasteful selection of Mediterranean, French, Italian and Continental specialties such as Italian Tomato Bruschetta, Seared Salmon with Pink Peppercorn Sauce, Grilled Beef Medallion, Classic Cheese Soufflé and Grilled Chicken with Grain Mustard Sauce. A selection of unique and refreshing mocktails is also offered. With cooking experts Ms. Zubeda Tariq and her son Hussain Tariq behind the recipes at Cafe Blue Ginger, one can expect exceptionally tasty and creative dishes. Ms. Zubeda Tariq, a household name today, forayed into the gourmet field almost 20 years ago. She initially started with an advisory service attached with a multinational company where she provided free of charge consultation and recipes to the harried housewives and young entrants in the kitchen. The response was phenomenal and very soon she was offered the chance to take up a platform in the visual media to make herself and her expertise more accessible. Today she has hosted more than 3500 TV shows, plus many audio shows and public appearances. She has published three recipe books and her much desired book on cooking tips which is now out on the market. Hussein Tariq also has a special interest in gourmet cuisine and has been demonstrating his talents on a widely popular cooking shows on Zaiqa TV for the last ten months. Some popular soups and starters include the Seafood Bisque, Rocket and Walnut Salad and Insalata Caprese. For specialty appetizers, the Stuffed Giant Mushrooms and the Classic Cheese Soufflé. The home-made pastas include Pantacce Pesto and Fettuccini Prawns with Spicy Marinara Sauce, while hearty main entrées include Stuffed Roast Chicken, Grilled Chicken Piccata, the Super Jumbo Shell Prawns, Grilled Sea Bass with Tomato Wasabi Sauce, Rib Eye Steak and Grilled Lamb Chops. The restaurant also offers classic thin crust cheese pizzas in a variety of gourmet choices such as classic Margarita, Shrimp and Pesto. Enjoy lunch with a sandwich prepared with home-made bread and for the sweet tooth, the Molten Chocolate Cake and Classic Bread Pudding. Exotic Pakistani flavors for the traditional Desi palette will be introduced in the coming months. Café Blue Ginger's signature style is to serve wholesome meals with simple, yet aesthetically vibrant presentations; an eclectic cuisine which caters to a variety of tastes and pallets. Each of the chefs enjoy a specialized niche which contribute to their expertise for the recipes. The spices are mixed in-house and the sauces are unique and flavorful. In addition, the utmost care is taken in using the freshest of vegetables and top quality meats. The ingredients for all dishes are top quality with minimum use of nonessential ingredients, thus bringing out the distinct flavor of each essential ingredient. The walls at Cafe Blue Ginger are embellished with sketches by Anwar Maqsood and paintings by Hussain himself, old letters and manuscripts, along with old pottery and porcelain dating back to the 19th and early 20th century and not to forget the replicas of antique lights; all from Hussain’s very own private collection. This creates a nice, cozy feel while also adding a meaningful aspect as one can sit and enjoy the grandeur of the glory and lifestyle of the bygone era. The restaurant gives a lived-in, rustic atmosphere which makes one feel that it's been there for years and years. From the entire façade to the every nook and corner, the entire restaurant has been artistically designed by Hussain under his company logo “at home”. In addition, Cafe Blue Ginger can accommodate up to 50 people and has been equipped with ionizers for a smoke-free, purified area, which provides a more healthful environment even in the smoking areas. Cafe Blue Ginger is proud to offer a full breakfast beginning at 7:30am until 12 noon. Dine in a style before work or after the gym in Blue Ginger's artistic and rustic atmosphere. Choose from classic American breakfast items such as omelets in all styles served with hash browns, French toast, pancakes, waffles and the Traditional English Breakfast. Also available are contemporary favorites such as smoked salmon with cream cheese on a toasted bagel. 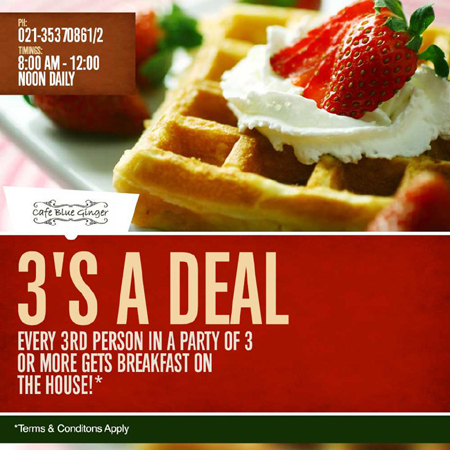 Enjoy one of the top breakfast offerings in Karachi at Cafe Blue Ginger. Owners Hussain Tariq, son of popular cooking icon Ms. Zubeda Tariq, and Hassan Raza, an avid food lover who doesn't compromise when it comes to good food and who has dined in the best restaurants from all over the world, bring their down-to-earth, friendly and artistic nature to Café Blue Ginger. They wanted to create a café where people could come to relax and enjoy quality cuisine and drinks in an artistic and unique atmosphere. "At Café Blue Ginger, the main principal we have learned is that the restaurant business is really the people business. People love to go out to eat in a restaurant, but only if the whole experience is sensational". At Café Blue Ginger, all aspects have been considered such as food quality and availability, ambiance, uniqueness, customer service and hygiene in order to create the perfect environment for a memorable and enjoyable dining experience for all who visit. Snob Special of the Month: Get 15% off your bill when you show your valid Snob Membership Card. This offer is not valid in conjunction with any current deals. Catering: Available for up to 45 people for private dinners, please inquire within. Pre-Set Menus: Preset menus for lunch and dinners and can be customized to suit the needs of the guests. Reservations: Reservations are suggested, but not required. Walk-ins are welcome. What to Expect: Something new and unique to the dining community. A cozy, artsy environment and ambiance with a Mediterranean menu.